I always remember my mum knitting or doing cross stitch. Over the years I've dabbled in both, a few years ago I made Doug our dog and although I'm not fast, I can knit. It's a skill my mum taught me (although I can't remember when or how). For a while now I've been conscious that I'd like to pass on a craft skill to Bubba if she wants to learn. If she doesn't then I can make things for her or her children like my mum does. 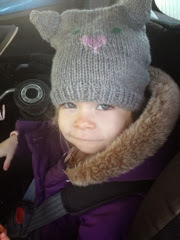 This was my latest want...a cat hat for my girl which my mum took on and finished within days. It's unique and looks fab on my girl. I've already lined up my mums next project, my mum can whip up lots of things without seemingly even looking at the needles, her hands just take over. So seeing as my mum has knitting and cross stitch, I decided to have a go at crochet. Last year I tried and tried to no avail on my own with just you tube videos and patterns. I did ok until I went wrong and had no one to ask. So a month ago I booked myself (& mum) on a day course at Craft Bee in Beckenham. Having had practice, I picked it up quite easily but my mum found it harder as her hands just wanted to treat it as knitting. 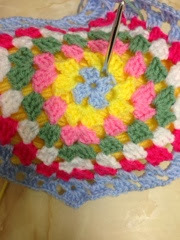 Since then I've been beavering away making granny squares and if/when I get better I'd like to try making blankets for my babies. I really hope I keep it up and can show bubba a skill when she grows up. She is already a bit too interested in balls of wool, as soon as she sees it she starts meowing like a cat and lunges for the ball and runs of with it giggling and tearing it apart. I already spend too much time trying to untangle knots!